Pet owners across the UK are spending up to £140 extra a year on energy bills in order to keep them warm while they’re away, a recent news report into the matter has been able to reveal. The research by Energy Saving Trust found that two in five (43%) pet owners admit to leaving the heating on during the day to keep their pets warm, while a quarter (26%) turn on the radio and more than one in ten (15%) leave the TV on to keep them company. Overall this amounts to a combined £78 million extra a year on gas and electricity when they turn on the heating and TVs or radios because of concerns their cats and dogs could feel cold, stressed or alone while they are out. Rosie Barclay, chairwoman of the Association of Pet Behaviour Counsellors, said: “Our pets have different needs when it comes to staying warm and comfortable, but people are often tempted to humanise their pets, thinking they enjoy the same things us. If you’re a pet owner and you’d like to cut down your energy bills by up to 30 percent, but in the same time ensure a fairly good level of comfort for your dog or cat, then you should look no further than HeatSave. 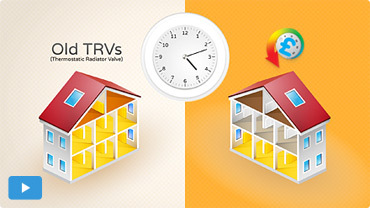 HeatSave is a wireless programmable TRV (thermostatic radiator valve) that grants users a superior level of control over the heating patterns in their homes, compared to both standard TRVs and ordinary thermostats. The HeatSave TRV will let you easily plan up to four years in advance for times when the heating will not be in use, as well as set specific heating patterns for each individual radiators, thus maximizing the zoning potential. The valve also comes equipped with a ‘hands on’ override button for quick temperature settings. Plus, the TRVs also generate a rather low level of noise while in operation, so chances are that your pet won’t even notice their presence. If you want to find out more about the benefits provided by our HeatSave wireless TRVs, please contact our dedicated team, they’ll be more than happy to answer any of your questions.